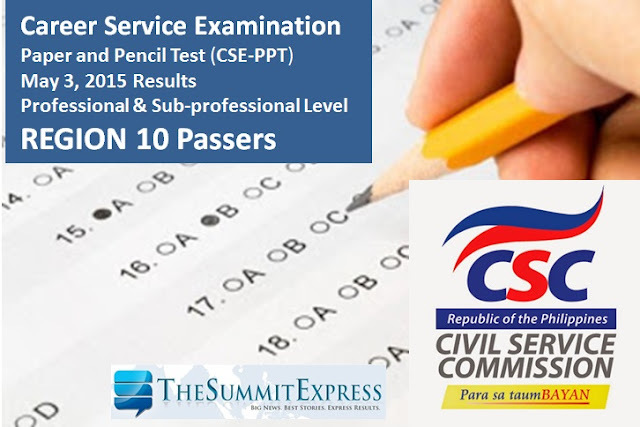 The results of May 2015 Career Service Exam- Paper and Pencil Test (CSE-PPT) are available here. The Civil Service Commission(CSC) released the full list of passers per region for the Sub-Professional Examinations on Friday, June 12, 2015. The list of passers for Region 10 (Northern Mindanao) for the Professional and Sub-Professional Levels are available below. The CSC named a total of 68 new passers for the sub-professional level. UPDATE: Official results for Professional Level out on Monday, June 12.